Pete suggested we download some old Beach Boys music for Reef. In case you haven’t noticed, the 9 mo old is destined surfer. Aside from his name, his room is decked out in surfboards and hibiscus flowers. Side note: the kid is currently afraid of water. Yeah. Anyhoodle, the Beach Boys are having a fiftieth anniversary tour. 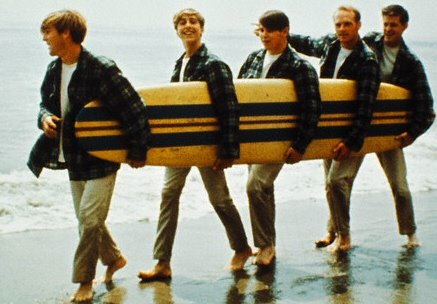 Is it just me, or does anyone else find it disheartening to think of seventy year old men still singing about going on a surfing safari, or of their fascination with California Girls, or about various cars that were popular fifty years ago? I like Good Vibrations as much as the next person, but when those Good Vibrations are caused by prostate issues and cardiac arrest…well…one might forgive me for thinking that maybe it’s time for them to hang up their hats, so to speak. This reminded me of something I saw advertised a while back; it was a reunion of KC and the Sunshine Band. I started singing “Do a little dance, make a little love, get down tonight.” And the “get down tonight” made me imagine them stroking and falling over. And yet. I turned thirty-four a few weeks ago, and I will say that I’m finding it a struggle to retain my stylishness without looking like mutton dressed as lamb, as my nanny used to say. I still wear Hollister and Abercrombie and Roxy and Pink, for the love of god. Every day I wonder if I look okay, or if one of the sixth grade girls at my son’s school is going to compliment me on my outfit because she has the same one. All of which is to say, I understand their struggle with aging. It’s hard to shake off the glory days of the past, especially if said glory days are accompanied with fame and fortune. Not that this is an issue with me, but still. I understand. I have a nervous feeling that I’m going to be one of those crazy looking old women with bleached blonde hair and bright lipstick feathering into the creases around my mouth, wearing shamefully inappropriate clothing and way too much perfume. Ack! Perhaps I should start now, wearing housedresses and elastic-waist polyester slacks, with plastic earrings that match my plastic beaded necklace. Or maybe not. After all, the bleached blonde haired old ladies are the most fun, am I right?